On the Con Air Providers page I already mentioned the private airfield of All West Freight Inc. (sometimes also spelled as Allwest Freight), located near Delta Junction in Alaska. The airfield, which is owned by Bill Michel (a.k.a. "Wild Bill") and his wife Barbie, is aptly called All West Airport (coded AK77 by the FAA). Two of Bill Michel's trio of Fairchild C-123 Providers were reported to be based there. Which is why quite a few enthusiasts went looking for it. Skyvan N549WB, stored in a separate area away from the hangar. This photo shows the dense trees which do a very good job of hiding the entire airfield from view and making it very difficult to find. Click on the photo for a larger image. Unfortunately the airfield proved to be very hard to find. Several people have unsuccessfully tried to locate it, often ending up at the small airport of Delta Junction (which is where you go to if you simply follow the small airport signs). But there are no Providers there. Adding to the confusion is that someone reported seeing a Provider at Delta Junction in June 2005, a sighting which is almost certainly incorrect. But during our visit to the area in June 2006 we did manage to locate this mysterious airfield. With the help of a portable Garmin GPS device, I must add, which I had fed the coordinates of the airfield before I left home. The hangar and apron of All West Airport are surrounded by dense trees on three of the four sides, and it is totally impossible to see anything of it from the main road. Also there are no signs to the airfield anywhere. Without the GPS device telling us exactly where to go, we too probably wouldn't have been able to find it. When we got there, owner Bill Michel was away in one of his aircraft, but we soon got to talk to his wife, Barbie. She very kindly showed us around, all the while telling us about their freighting activities, which were of course mainly focused on the many mining operations in Alaska. Half an hour later Barbie went inside the house, after giving us permission to roam around the airport and photograph everything we wanted. Of course we did not decline such a kind offer! The airfield turned out to be surprisingly new and clean. It has a gravel runway and there's a large hangar that was obviously built quite recently. In front of this hangar is an even newer concrete apron, no gravel or turf here. And yes, both Providers were there, as well as a few more pleasant surprises! Former moviestar N709RR is All West Freight largest aircraft. It is seen here parked on the new and very clean concrete apron in front of the hangar, proudly displaying its Large Marge nose art. Click on the photo for a larger image or click on the nose art to see Large Marge up close. 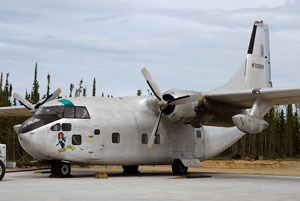 - C-123K Provider N709RR (msn 20158, ex 54-0709) was bought in December 2003, and delivered to Alaska in the autumn of 2004. It is the company's flagship, and currently their only operational Provider. During our visit on 11 June 2006 it was parked out on the apron and still carried the same colours and "Large Marge" nose art as it did when flying for its previous owner, Ray Petkow. On the Con Air Providers page you can read more about this former moviestar and its history. - C-123J Provider N4390E (msn 20274 ex 56-4390) was a long-time Anchorage resident, belonging to the Alaska Aviation Heritage Museum. But the museum did not have the space to display it, and it was stored elsewhere on the airport, in a rather poor state. Bill Michel bought it in 2004, but before he was able to move it to All West Airport, it suffered some damage during a severe storm. It was dismantled and transported up north to All West's private airfield. There it now lies, hidden away behind a very large heap of sand, north of the hangar. Although still dismantled, it appeared to be basically complete. Note that the aircraft is not visible from the hangar. You need to walk up to the large sand heap and around it to see it! - SC.7-3-100 Skyvan N549WB (msn SH.1911 ex XA-SRD) was All West's first larger aircraft, bought in April 1997. It was present at the airfield at the time of our visit, but it was no longer operational. It was stored in a separate area away from the apron, with both props missing. 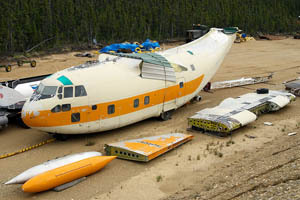 This aircraft suffered an accident on 5 April 2000, when it tried to land at the Pogo Mine airstrip, 46 miles northeast of Delta Junction. The airstrip was covered with ice and the Skyvan started to veer to the right. The nosewheel hit a snow bank, causing considerable damage to the nosewheel bulkhead. There were no signs of that damage during our visit though, in fact the aircraft appeared to be in very good condition, except for the missing props. Obviously some repairs have been carried out, and the accident may have nothing to do with it being stored at All West Airport today. - SC.7-3-200 Skyvan N50DA (msn SH.1852, ex G-AWVM) was acquired from North Star Air Cargo in May 2002. It was present at the time of our visit, but it was also stored in the separate area (next to N549WB), this aircraft with both engines missing. 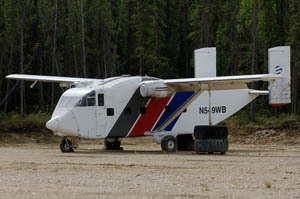 As with N549WB, this Skyvan seemed to be in excellent condition, and it is unclear exactly why it has been withdrawn from use. Provider N4390E was trucked here from Anchorage, and now lies dismantled out of view behind a large heap of sand, north of the hangar. Click on the photo for a larger image. - C-123K Provider N123K (msn 20014 ex 54-0565) was purchased in 2003, but it is still being worked on at its old homebase at Deer Valley Airport near Phoenix, Arizona. When Bill bought it, N123K hadn't flown for several years (probably since Thunderbird Aviation sold it in January 1998), and apparently it is taking a lot of time to get it up in the air again. Barbie told us they hope to fly this to their Alaska base later this year or in 2007. - SC.7-3A-100 Skyvan N754BD (msn SH.1907 ex G-BKMD) is All West's only operational Skyvan, acquired also from North Star Air Cargo in September 2000. At the time of our visit owner Bill Michel was away in this aircraft, delivering cargo to the short, remote airstrip of Anaktuvuk Pass. Apart from these aircraft, All West Airport also had a very pleasant surprise for us in the form of the unique and long-lost Hawk Industries GAF-125 GAFHawk 125, registered N101GH. Read more about this fascinating aircraft on the GAFHawk 125 page. Many thanks go to Barbie Michel, for the very kind tour we received around the airport and the hangar, and for allowing us to freely roam around afterwards! At the request of the owners of All West Freight and its airport, I have removed the detailed instructions for locating the airport, as well as some other information, from this webpage. The owners would like to stress the fact that All West Airport is NOT a public airport. It is the private property of the owners, and as such it is, strictly speaking, off-limits to all strangers. The owners do not appreciate visitors, nor do they like to receive phone calls from enthousiasts trying to arrange a visit or asking about any of their aircraft. Please take all this into consideration. Today I received the devastating news that All West Freight's C-123 Provider N709RR "Large Marge" crashed in the Denali National Park yesterday afternoon. All three on board lost their lives in the crash. No further information is available at this moment. It is with great regret that I learned today, as feared, that Bill Michel, whom everyone knew as "Wild Bill", was among the three victims of the crash. My deepest condolences go out to his wife Barbie, and to his children and grandchildren, family and friends. The two other victims of this terrible crash were John Eshleman and Paul Quartly, both from Wasilla, AK. John was the founder and owner of Steppers Construction, which also owned two C-123K Providers (N4254H msn 20052 and N87DT msn 20030), and operated out of Wolf Lake Airport near Wasilla. The family and friends of John and Paul also have my deepest condolences. Details of the crash can be found on the NTSB website.